• 53-18 Royal Norwegian Air Force (Kongelige Norske Luftforsvaret). Handed over on 02-Mar-1954 and was then shipped in a crate from Downsview to Oslo, arriving in Oslo Harbour on 08-Apr-1954. After assembly taken on charge May-1954. Accident: Lake Soikkajavre, Finnmark 15-Aug-1959. The floats were damaged in a landing accident. The floats were temporarily repaired and the aircraft flown off the lake and back to Fornebu Air Base, Oslo for repair. Incident: Lake Mievtajavre, Finnmark, 29-Oct-1961.On a flight from Kirkenes to Bardufoss, the pilot of the float equipped aircraft was forced to make a landing due to bad weather with heavy snow. During the night, the lake froze and the Otter could not take off again. The Otter was pulled ashore and was guarded for nearly a month before the ice was strong enough for the Otter to take off on wheels. On 25-Nov-1961 it was flown off the frozen lake to Banak Air Base, and then back to its base at Bodø. Total time: 4,724 hours at Jan-1967. • LN-FAE Wideroes Flyveselskap A/S., Bodø, Norway. Regd 07-Feb-1967. Canx 10-Jun-1968. Accident: Rossfjord, some 45 kilometres south-west of Tromso 28-Mar-1968. The aircraft on amphibious floats departed from Tromso at 1015 hours for a scheduled flight to Harstad. In addition to the pilot, a company mechanic was on board as an assistant and there were three passengers. The weather was not good, with low cloud, heavy snow showers and reduced visibility. Due to the conditions, the pilot elected to divert from the track laid out in the company's route manual. This change of route however was not reported to air traffic control because of poor radio coverage at low altitude. This is a very rugged coastal area with numerous fjords and inlets amidst mountains rising to four thousand feet. As the Otter flew in on the west side of Rossfjord, some 45 kilometres south-west of Tromso, visibility dropped and the pilot said to his assistant “We'll cut across here, I know this area” and started a right turn. Eye witness reports put the aircraft at this time at between 100 feet and 25 feet above the ice-covered fjord, although the pilot was later to claim he was flying at 500 feet. Immediately after starting the turn, the right wingtip and float made contact with the ground. The aircraft was thrown to the left at the first impact and crashed at a 35 degree angle to its direction of travel. It caught fire and was burnt to destruction. All five occupants survived the crash but one passenger and the pilot's assistant suffered severe burns and were flown by helicopter to hospital in Tromso. Otter number 18 was one of ten DHC-3 delivered by DHC to the Royal Norwegian Air Force (Kongelige Norske Luftforrsvaret), the first six of which were delivered in 1954. All six were formally handed over on 2 March ’54 and were then shipped in crates from Downsview to Oslo, arriving Oslo Harbour 8 April ’54. They were assembled at Kjeller Air Force Base (AFB). With the Royal Norwegian Air Force the serial number comprised the Fiscal Year in which the aircraft was ordered together with the constructor’s number and this serial was painted on the fin. Thus aircraft 18, ordered in FY53, became serial 5318. Following assembly at Kjeller AFB., the Otter was taken on charge and allocated code O-AB. It was initially assigned in May 1954 to the Air Force Flying School at Vaernes AFB, for the training of pilots and mechanics. In June ’54 it was assigned to the Communications Flight at Jarlsberg AFB., and then at Vaernes AFB. In November ’54 it was assigned to the Communications Flight at Orland AFB., where it remained until early 1957 when it went to the Horten Marine Base for installation of straight floats and on 8 December ’57 it arrived with the Norseman Flight at Skattora Seaplane Base at Tromso. 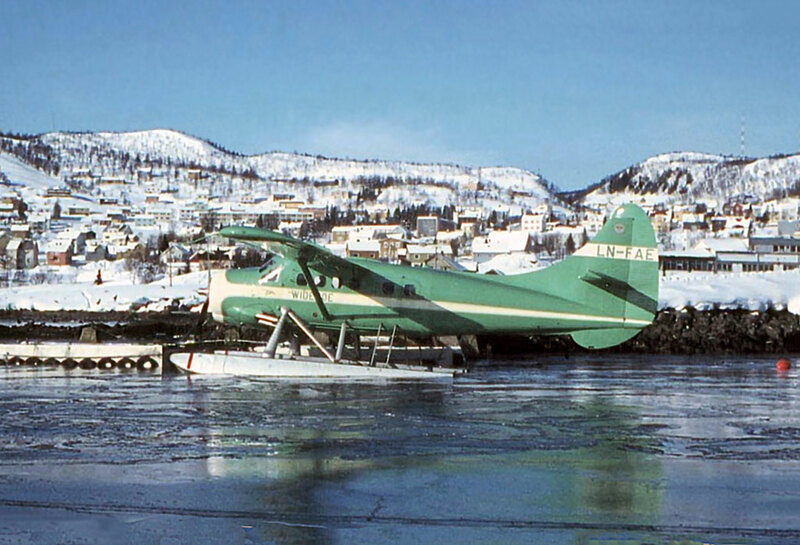 In February ’59 Otter 5318 transferred to 7193 Stotteving (Support Flight) at Bodø. On 15 August ’59 the floats were damaged in a landing accident on Lake Soikkajavre, a small lake in Finnmark (that part of Norway near the Russian border). The floats were temporarily repaired and the aircraft flown off the lake and back to Fornebu, Oslo for repair before return to Bodø on 29 September ’59. On 29 October 1961 on a flight from Kirkenes to Bardufoss AFB., the pilot was forced to make a landing on Lake Mievtajavre, Finnmark due to bad weather with heavy snow. During the night the lake froze and the Otter could not take off. The Otter was pulled ashore and guarded for nearly a month before the ice was strong enough for the Otter to take off on wheels. On 25 November ’61 it was flown off the frozen lake to Banak AFB., and then back to base at Bodø. During July 1962 it was at Fornebu for depot level maintenance with Widerøe before returning to Bodø on 20 November ’62. The Otter arrived at Bardufoss AFB., on 26 November 1963, returning to Bodø on 21 January 1964. It arrived at Fornebu again on 19 August ’64 for maintenance with Widerøe, returning to 7193 Support Flight Bodø by 16 December 1964 On 1 January 1966 7193 Support Flight at Bodo became 719 Squadron, which the Otter joined and in November ’66 it received the new squadron code XJ-S. It continued in service with 719 Squadron, Bodø until it arrived at Kjeller AFB., on 15 December 1966 on withdrawal from service, having been replaced by the DHC-6 Twin Otter. 5318 was formally struck off charge on 25 January 1967 having flown 4,724 hours in the service of the Royal Norwegian Air Force. It was put up for sale through Halle & Peterson, Oslo who were the DHC agents in Norway and was sold to Widerøes Flyveselskap A/S., to whom it was registered LN-FAE on 7 February 1967. It had been decided to launch a new route along the coast of the Helgeland District of northern Norway, linking the major centres of Bodø and Trondheim to the smaller communities. The new route was Bodø-Mo-i-Rana-Sandnessioen-Rorvik-Namsos-Trondheim, with the addition of a Trondheim to Hammerfest route. These expanded services were intended as a trial for the preparation of future landplane services. At that time Widerøe had three Otters in its fleet (LN-SUV / BDD / BIB) and needed an additional Otter for the new service, which led to the purchase of LN-FAE, thus restoring the Widerøe Otter fleet to four units, all operated on floats. LN-FAE however was only to last a year in Widerøe service before it was lost in an accident. On 28 March 1968 LN-FAE on amphibious floats departed from Tromso at 10:15 for a scheduled flight to Harstad. In addition to the pilot, a company mechanic was on board as an assistant and there were three passengers. The weather was not good, with low cloud, heavy snow showers and reduced visibility. Due to the conditions the pilot elected to divert from the track laid out in the company’s route manual. This change of route however was not reported to air traffic control because of poor radio coverage at low altitude. This is a very rugged coastal area with numerous fjords and inlets amidst mountains rising to four thousand feet. As the Otter flew in on the west side of Rossfjord, some 45 kilometres south-west of Tromso, visibility dropped and the pilot said to his assistant “We will cut across here, I know this area” and started a right turn. Eye-witness reports put the aircraft at this time at between 100 feet and 25 feet above the ice-covered fjord, although the pilot was later to claim he was flying at 500 feet. Immediately after starting the turn, the right wingtip and float made contact with the ground. The aircraft was thrown to the left at the first impact and crashed at a 35 degree angle to its direction of travel. It caught fire and was burnt to destruction. All five occupants survived the crash but one passenger and the pilot’s assistant suffered severe burns and were flown by helicopter to hospital in Tromso. The Otter was a write off and the registration was cancelled on 19 June 1968. The Accident investigation Board was not able to determine whether the pilot meant to make a 180 degree turn and fly back out of the fjord, or initiate a climb to get across a low mountain ridge and out into the next fjord to the west. The Board concluded that the accident was caused by the pilot’s decision to turn towards higher terrain. If the purpose was to exit the fjord, it should have been made to the left over the fjord. If it was to climb across the ridge, it would not have been possible to clear the terrain, given the aircraft’s weight and performance.